Dean: candidate of science, associate professor Alexander Kuzmin. Faculty of History of Moscow State Pedagogical University is one of the oldest educational departments of the faculty. First its doors were opened in 1900 as a historical and philosophical department of Moscow Higher Women’s Courses, and later became faculty of history and philology. Tradition of teaching history disciplines at our university has a long history, going back to the time of founding Moscow Higher Women’s Courses in 1872. Many outstanding historians worked at the Courses such as Vladimir Ivanovich Guerrier, Pavel Gavrilovich Vinogradov, Vasily Osipovich Klyuchevsky. By reopening the courses in 1900 these traditions were fully continued. Faculty of History and Philology united the pick of Moscow historical science. Mikhail Mikhailovich Bogoslovsky, Yuri Vladimirovich Gotye, Alexandr Alexandrovich Kizevetter, Matwey Kuzmich Lyubavsky, Dmitry Moiseevich Petrushevsky, Vladimir Ivanovich Picheta, Boris Aleksandrovich Turaev, Ivan Vladimirovich Tsvetayev and many other historians worked at Moscow Higher Women’s Courses. Difficult years of revolution and civil war left a deep mark in the history of our institution. «Optimizing» the system of higher education in Moscow, two former faculties of Moscow Higher Women’s Courses that were renamed to the 2nd Moscow State University, including the faculty of history and philology, were transferred to the 1st Moscow State University. But the historical education revived within the Faculty of Education — the first in Russia, where social and historical department was established. It was rebuilt and renamed many times, and finally in 1932 it became purely historic. By that time the faculty of education had been already transformed into an independent institution — Moscow State Pedagogical Institute. In 1934, when the faculty structure was returned to institutions of higher education, historical department became again faculty. Since then and until today the faculty of history has been the source of pedagogical personnel for historical education and from year to year it has been producing highly qualified teachers. Position of a leading pedagogical institution in the country that Moscow State Pedagogical Institute n.a. V.I. Lenin acquires year after year obliges the Faculty to be one of the largest centers of historical science and education. And it should be noticed that the Faculty fully did and does it with honor. After the Moscow State Pedagogical Institute n.a. V.I. Lenin has included in its membership Moscow City Pedagogical Institute, departments of the Faculty have increased considerably by replenishing with highly qualified teachers. Academicians and Corresponding Members of the Academy of Sciences of the USSR Mikhail Nikolayevich Pokrovsky, Isaak Izrailevich Mints, Alexey Leontyevich Narochnitsky, Anna Mikhaylovna Pankratova; Professors Nikolay Pavlovich Gratsiansky, Vladimir Ivanovich Dyakov, Viktor Fedorovich Semenov, Eduard Nikolaevich Burdzhalov, Dmitry Sergeevich Baburin, Gennady Andreyevich Koshelenko, Petr Vasilyevich Gora, Nikolay Ivanovich Pavlenko, Victor Grigoryevich Tyukavkin, Vladimir Borisovich Kobrin, Apollon Grigoryevich Kuzmin and many others. Even today their names are well-known not only for specialists and historians, but also for educated people. History of the Faculty interweaves closely with the history of higher education and the history of historical science in Russia. Among the graduates of the Faculty of History are many famous people. Vladimir Petrovich Lukin is Commissioner for human rights of the Russian Federation, one of the founders of the party «Yabloko» (graduated in 1959), Yuly Chersanovich Kim is a poet, composer, playwright, scenarist, singer (graduated in 1959), Lyubov Petrovna Kezina — Head of Capital education in the 1989-2007 years (graduated in 1965), Evgeny Aleksandrovich Yamburg — Director of Education Center № 109 (graduated in 1973), Alexandr Fedotovich Kiselev — Executive Director of the Publishing House «Drofa,» in the past, First Deputy Minister of Education of the Russian Federation (graduated in 1974), Alexey Alekseevich Venediktov – chief editor of the radio station «Ekho Moskvy» (graduated in 1978), Andrey Konstantinovich Isaev — union leader, State Duma’s deputy of the third to sixth convocations (graduated in 1989) and many others. Graduates of the Faculty of History of Moscow State Pedagogical University were Marina Nikovaevna Chernova — «Teacher of the Year in Moscow» in 1997, Andrey Vladimirovich Lukutin — «Teacher of the Year in Moscow» and prize winner of the contest «Teacher of the Year in Russia» in 2004, Vladimir Vladimirovich Kruzhalov — «Teacher of the Year in Moscow» and prize winner of the contest «Teacher of the Year in Russia» in 2009. Traditions of the Faculty are continuing also today. 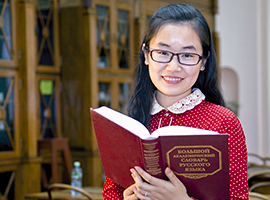 Five departments of the faculty of history: Ancient and Medieval History, Modern and Contemporary History, Russian History, Contemporary National History, Methods of Teaching History – carry out a lot of research and teaching. Two dissertation councils provide review and defending the academic degrees of candidate and doctor of historical sciences on a broad range of historical disciplines. Among more than fifty full-time faculty members 91% have academic degrees and titles, including 39% of professors and doctors of science. Since 2011 the Faculty has been receiving for the first year of study in the following areas: «History» with major in «Historical political science» and «Pedagogical education» with majors in «History», «History and social science», «History and foreign language (English)» «History and law». 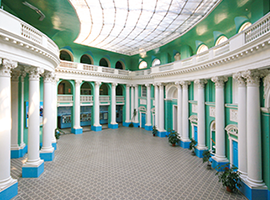 In the future it is planned to open the direction «Museology.» There are also two Master’s programs at the Faculty of History: «History» (the program «Methodological problems of historical science») and «Pedagogical education» (programs «Social and historical education» and «Social and anthropological education»). Range of post-graduate specialties is also expanding. 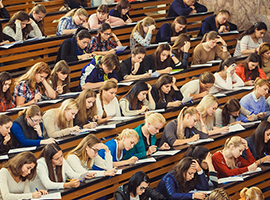 The competition figures show that the Faculty is still very popular among students. The average score of the unified state exam of the faculty applicants also confirms this. It is considerably above the national average for these specialties in the country. The Faculty trains bachelors and specialists not only in full-time education, but also in part-time (evening), by correspondence and in the form of external studies. In total more than 800 students, undergraduates, postgraduates and doctoral students study at the Faculty of History today. The Faculty carries out an extensive innovative work. The development of using information technology in the educational process, new computer technology, the development of innovative learning courses and new training programs, in particular the innovative educational Master’s program «Social and anthropological education» and innovative textbooks on social and humanity disciplines. The system of retraining and qualification improvement of the teaching staff is transferred to the permanent regime. In 2010 the Faculty introduced a new system of evaluation of students’ knowledge with the ranking.